IN A landmark amendment to the law governing Maharashtra’s water regulatory system, the state has placed agriculture above industry in priority for allocating water from dams. Before the amendment of the Maharashtra Water Resources Regulatory Authority (MWRRA) Act 2005, Maharashtra was the only state in the country to have given industry priority over agriculture in water allocation. All concerned have welcomed the overdue correction of priorities. The amendment also gives water allocation rights to the state Cabinet, instead of a committee of ministers chaired by the water resources minister, as intended earlier. The amendment was moved amid intense protests from farmers’ and water rights groups. Initially, the amendment bill transferred the water allocation rights from MWRRA to the group of ministers. It was moved in the state legislative council on April 15 and passed in the wee hours of April 16. It also cancelled several farmerfriendly provisions in the Act and made all diversions of water from agriculture to non-agricultural uses made till date immune from court action. However, following stiff resistance to the bill not just from people’s groups but also from Congress MLAs, chief minister Prithviraj Chavan intervened and moved a correction motion which changed the allocation priority and gave allocation rights to the Cabinet. The altered amendment was cleared by both houses of the legislature on April 20 and 21 respectively. People’s groups vehemently oppose the provision in the new amendment that makes earlier water diversions from agriculture to non-agricultural uses immune from challenge in court. An analysis of water diversion from dams since 2003 by Prayas, a non-profit in Pune, based on documents accessed through RTI, shows 54 per cent of the diverted water has gone to industry (see ‘Unfair diversion’). “The loss to farmers is an estimated Rs 5,300 crore per year,” says Sachin Wargade of Prayas. Granting immunity against court action to these diversions is unfair given that court cases are pending against some diversions. The most important of these is the case filed by former MLA and activist B T Deshmukh against diversion of 88 million cubic meter (mcm) water from the Upper Wardha dam in Amravati district to India Bulls’s coal-based power plant at Nandgaopeth, depriving 24,000 hectare (ha) land of irrigation. “This is an obvious attempt by the government to wriggle out of legal tangles,” says Sanjay Kolhe of Pani Bachao Samiti, Amravati. “We want the government to reinstate the farmer-friendly provisions of the original Act, and to return the illegally diverted water to farmers,” says Patankar, threatening an agitation by Lokabhimukh Pani Dhoran Sangharsh Manch, under which groups working for water rights in the state are organised. 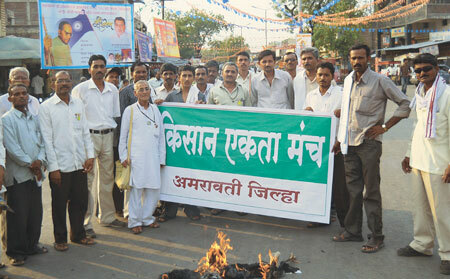 Water rights and farmers’ groups will meet in May in Pune to plan the agitation.